The Madaba Map is a sixth century CE floor mosaic partially preserved in the Byzantine Church of St George in Madaba, Jordan. It is the earliest extant example of a map of the 'Holy City of Jerusalem'. Much of the map, which was likely originally around 7 metres high and 22 metres long, has now been lost; only a fragmentary remnant of 5 metres by 10 metres survives. Jerusalem would have been at the heart of the sixth century map. 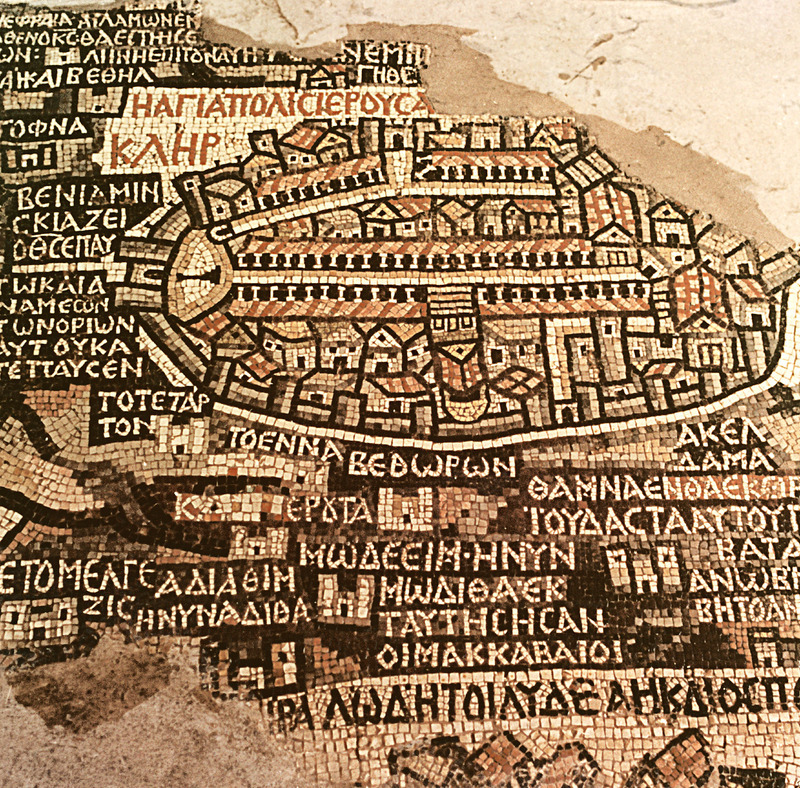 Among the key features of the map's rendering of the city are the Roman Cardo—the main street running through Jerusalem, which serves as the map's major horizontal axis—and several major Byzantine churches, including the Hagia Sophia and the Nea Church. The wider map also includes Palestine, the Transjordan, and part of Egypt. The Jerusalem section does not, however, offer an accurate geographical representation of the city. Rather, it offers an image of the idealised Jerusalem of the Christian artist's imagination, with the Church of the Holy Sepulchre placed directly at the city’s heart, even though this is geographically inaccurate. Another cartographic anomaly in the map is the absence of the Temple Mount. This was probably omitted deliberately by the artist(s). The erasure of the site from Christian topography seems to have developed in reaction against Jewish attempts to re-build the Temple in the fourth century CE. Numerous Christians successfully protested against the project at the time that the rebuilding was proposed, because they believed that the site should be allowed to remain in ruins as a sign of the fulfilment of Jesus' prophecy that the Temple would be destroyed. An alternative explanation may be that during the sixth century CE the Temple Mount was not considered part of the city proper, because it was located beyond the city walls.